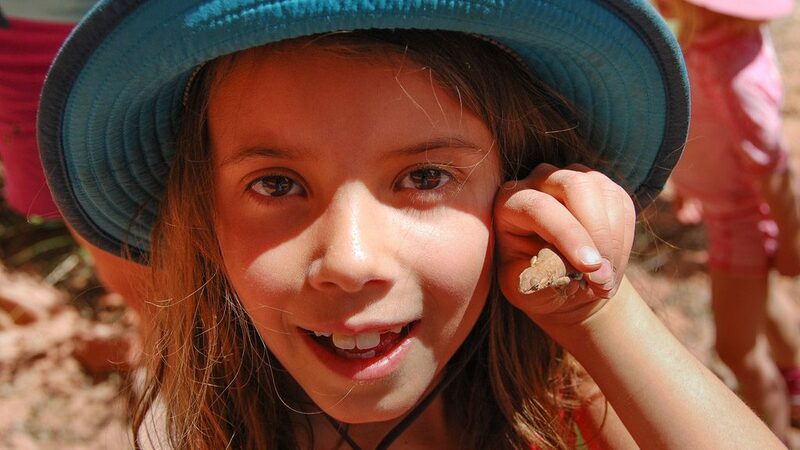 “Look at that cutie!” Nyla spins towards me, her heels kicking up red dust into the sun-filled canyon of Utah’s San Juan River, raising her hand to show me what she’s got gently clasped between her eight-year-old fingers: a desert lizard. The voice of our guide sways in the light breeze as she explains the origin story of the rock art on the Navajo sandstone wall behind us. It’s incredible and my wife is drooling over it, like much of the sights on our multi-day whitewater rafting trip. But Nyla has no interest in the life of ancient Basketmaker Indians from thousands of years ago. 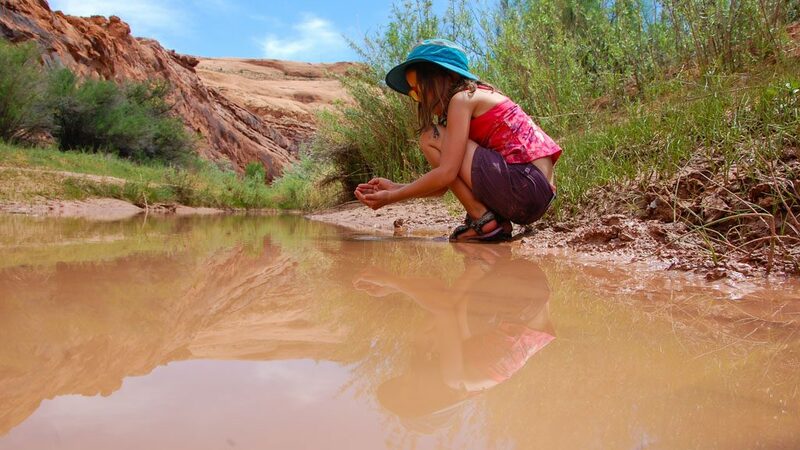 She’s absorbed with the lizards, the bugs, the sand, and the rushing current in this canyon. There’s something transcendent and magical about all of it. 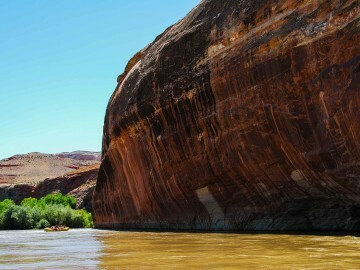 In the summer of 1980, my father first took my brother and me rafting on this same river. My brother was four and I was six. 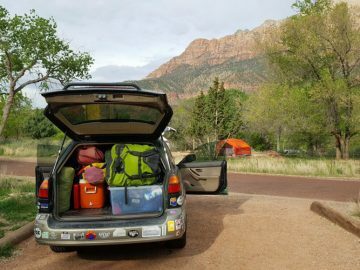 My dad worked at a community college and at the end of the semester that year he had our first generation Toyota 4Runner (the ones where you could take the top off) all loaded up with rafting gear. We hit the road the moment he was done. He was a woodworker and had made his own raft frame, storage boxes, and giant wooden oars and bought a used bucket boat for $100, constructed of floppy gray tubes that always seemed to need patching and pumping. 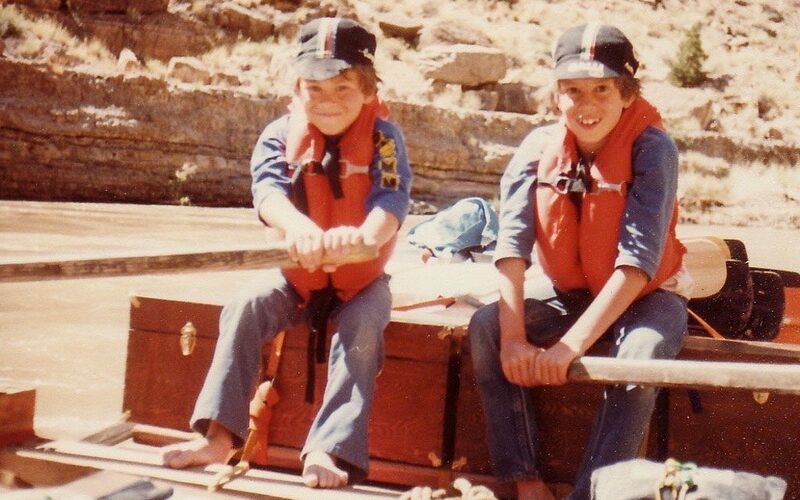 My father’s love for boating fueled much of my childhood. The summers then stretched on for what seemed like infinity and I have a flood of memories of life on the river: hiking to petroglyphs and hidden pools, playing 500 Rummy in caves, and layover days where we would spend all day swimming rapids, catching lizards, reading books, and playing in the mud. 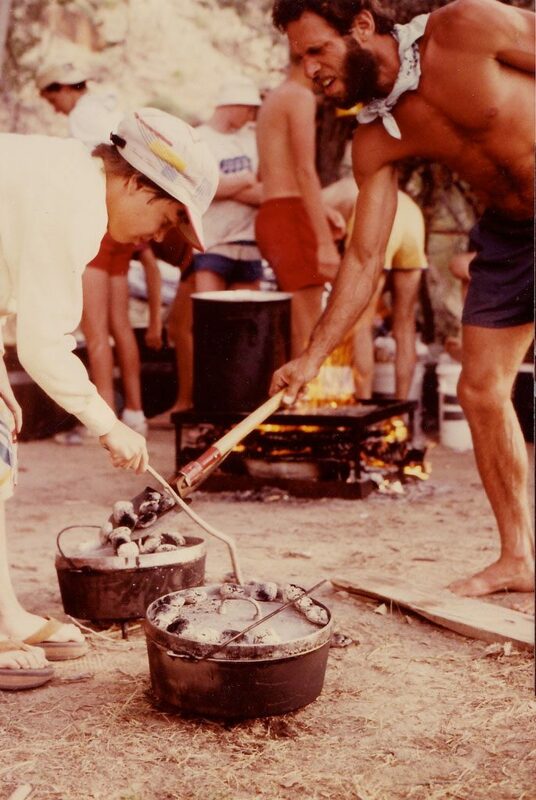 The smell of charcoal still transports me back to those rafting trips… wearing my favorite Duran Duran hat and flip flops, arranging coals on the Dutch oven with my dad. 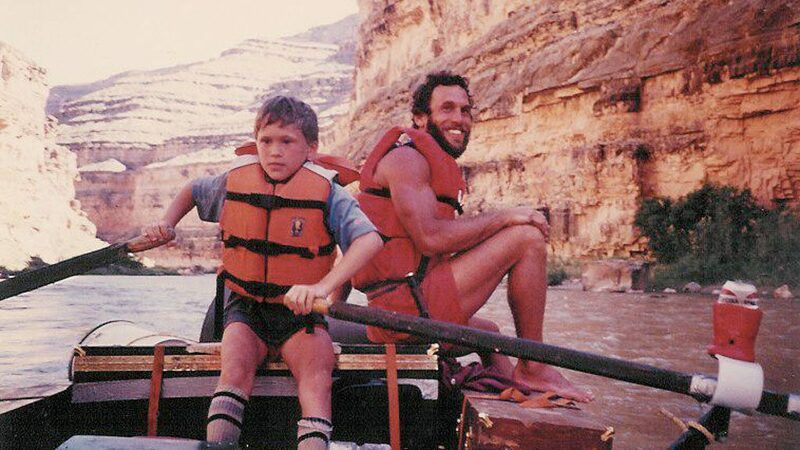 As I look back, I realize many of the experiences I shared on the river with my family set the course for who I am and inspired a deep nature connection that I’ve never lost. It gave me an appetite for adventure, risk, and hard work that has served me well in my personal and professional endeavors. Raising my own children this way has been difficult. Times have changed. Childhood has changed. 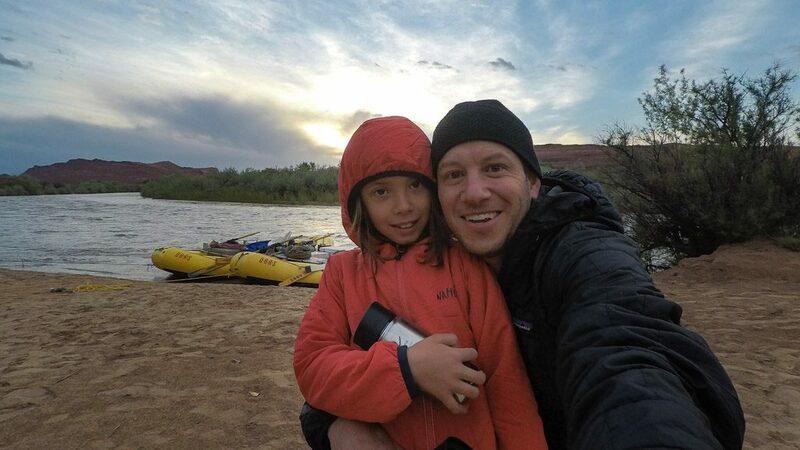 So earlier this year when I heard about the 100 Hours Unplugged Challenge—a call to action for people to trade screen time for family time and go outdoors together—a river trip seemed like the perfect way to take my family into the wilderness and offline. 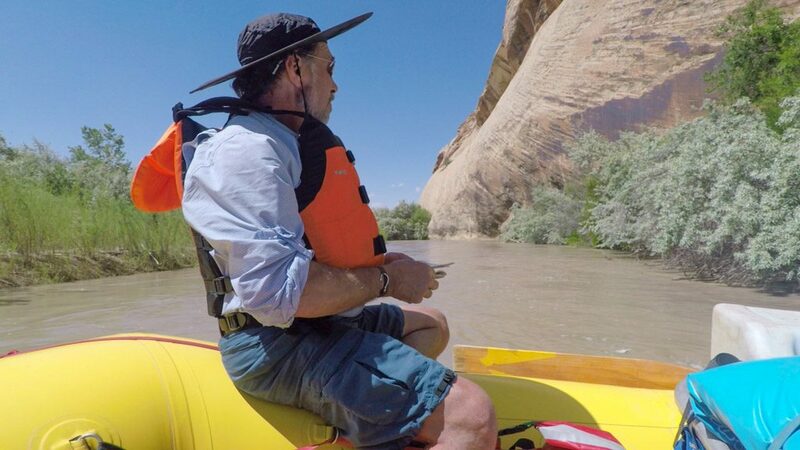 Unlike my father, however, I didn’t have the know-how to do a river trip on my own. 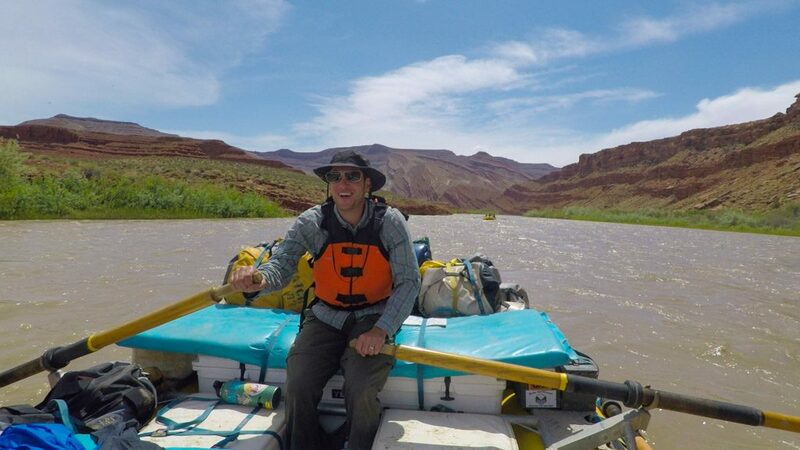 Since becoming a dad, I hadn’t done much about that, regrettably, so I booked a trip with OARS on the San Juan. 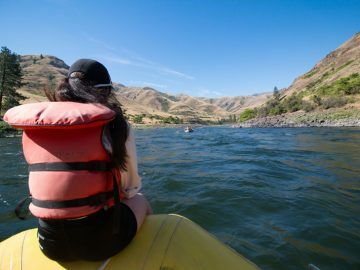 The river that I was first introduced to rafting would be the same river that I would introduce my daughter and wife to rafting. 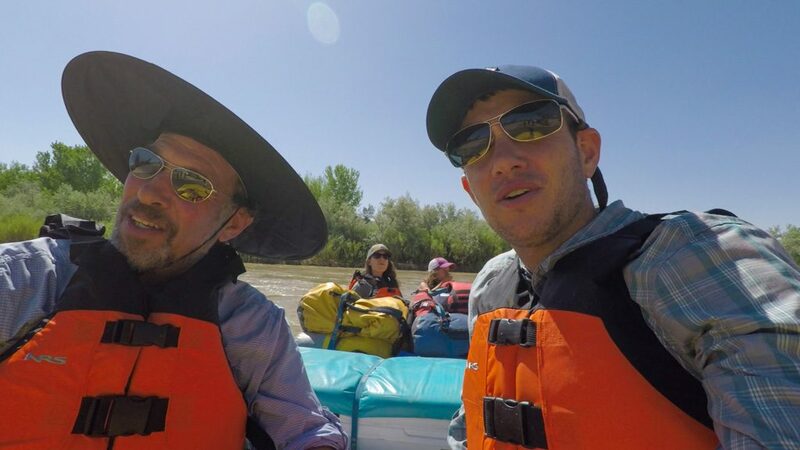 Not only that, my father accepted my invitation to join us on this commemorative trip – three generations of Sperlings on the San Juan River. “I don’t know,” I tell her, but we decide to go look for him and our other new friends. We make our way to the river. It’s moving quick, rushing between stands of invasive tamarisk trees. We see sand waves oscillating, moving up and down the muddy river, breaking and building as the sun climbs up toward the horizon. 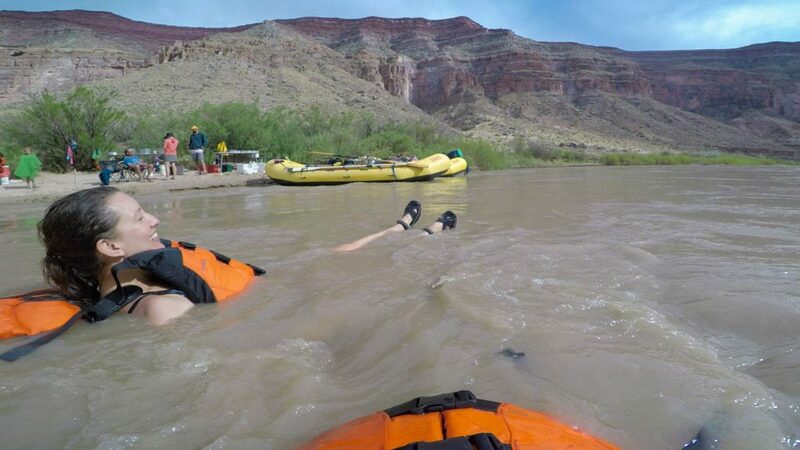 The oars, dry bags, coolers, and carabiners make a soft chorus, rubbing and clanging on the boats. It’s a beautiful moment. And we have nothing “more important” to do. We mull about, hunting together for coffee and hot chocolate, enjoying each other’s company in the still, early morning. After just a day of being disconnected from the grid, I find myself falling into the same schedule as my family. I’m surprised how big a difference this makes. My wife and I go to sleep and wake at the same time as our daughter. We eat all three meals together. We enjoy the same activities each day, from play to camp chores. Instead of soaking up content on our devices, we soak up a lot of quality time together. We focus on each other. Getting closer. After breakfast and floating down the river for a time we stop for lunch and a hike. We head up Chinle Wash, an arroyo which runs for some 65 miles in a canyon peppered with Anasazi cliff dwellings and granaries, rabbits, wild horses, and wild donkeys (yes, someone on the trip was singing, “Wild, wild donkeys, couldn’t drag me away”). 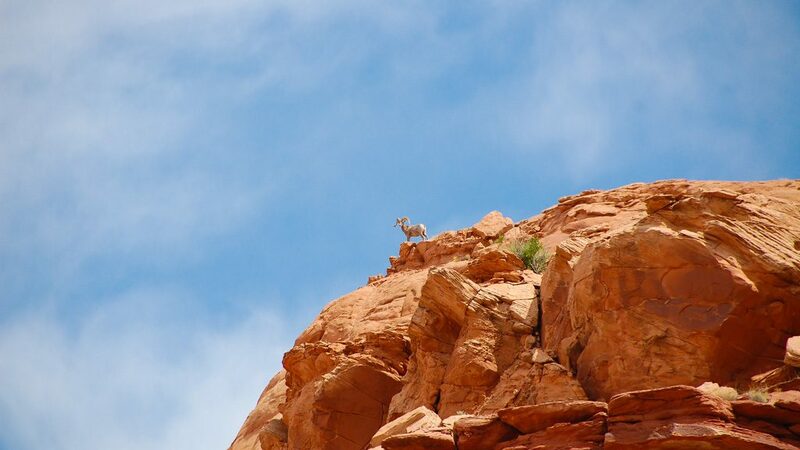 A ram has managed to step out to the point of the high canyon wall. So iconic. It’s one of those moments that are hard to believe. We decide to try to get the ram to turn toward us and make a cacophony of bird-like calls that bounce around, echoing in the hot, rugged canyon. The ram turns. “It worked! He heard us! He heard our silly calls!” His large horns come into full view. “Incredible! Magnificent!” Then, the ram nonchalantly turns back to gaze across the river… We call out again. And again the ram responds, turning towards us. We laugh and cheer and revel in our cross-canyon interaction. I reflect how different this is than at home, where I spend the bulk of my waking hours interacting with phones, screens, and media. It’s rare that my daily grind results in moments where the whole family is focused on interacting with our environment and each other. Unplugged, my attention naturally wanders to those around me. This moment with the bighorn sheep is one of those stories that we’ll remember forever, recorded in our family’s memory, told over and over. We travel down river looking for our campsite. Poppy sits on the bow of the 18-foot, self-bailing raft, glancing intermittently at the beautiful, craggy, painted walls of this winding canyon, often sprawling more than 1,500 stunningly-jaw-dropping-wipe-the-drool-off-my-chin feet toward the sky. His gaze drops back down at the map in his hand. The map is old as dirt, wrinkled, falling apart at the joints, and starting to fade. The oars pivot the boat tenderly, shadows dance on the tough NRS rubber, a great blue heron beats its wings and lifts up from the shoreline into the blue sky. A white egret joins the heron coasting along in the sky. We float around a corner and spot a cliff dwelling in the distance. Thirty-six hours into the trip and it’s dawning on me how much I depend on devices to find my way in the world before getting lost in their rabbit holes: after I complete an intended task I can easily slip to checking Instagram again, looking to see if there are any unread emails again, sending another animated .gif text message all in hopes of a dopamine release in my brain for that momentary hit of pleasure. Replacing my dependency on digital things with analog predecessors is giving me a great sense of tranquility. Instead of thinking about what might be waiting for me in the wired ether, I’m considering the scenery, hydraulics of water, and how one might manufacture a waterproof map like the one my dad holds. My journey through the world feels more linear, controlled, and peaceful. My community of boaters, also off the grid, are far less distracted and present as well, making for an uplifting and peaceful communal experience. We’ve made it to my favorite campsite of the trip. My wife laughs as the tentacles of Ledge Rapid rip us downstream in our bright orange PFDs. We swoosh our arms as paddles, point our water-shoe clad feet toward the sky and work to keep “knees and toes” up. The water is bone chilling and fast. We pass the camp kitchen, dining room, s’mores fire pit, and rafts, and then pull ourselves in a ferry angle towards the bank. After a few more strokes of our arms, we realize we’ve made it to the shallows and stand up in shin-deep water. Upstream, we can see Nyla laugh as she traverses the eddy and then plunges into the rushing current with other rafters. The sun gets to its job of warming us as we trek upstream for another float. Days now into our trip and being unplugged, I notice my mental reflex of reaching for my pocket where my smartphone lives is dwindling. I couldn’t believe how many times this happened throughout the past day but now it’s subsiding. I am stunned thinking back to the previous night, too, when my mind drifted to wondering what’s new on Netflix. Is the next season of Sense 8 available? Is there anything else like Travelers we could watch? I’m amazed how effortless it is to reclaim an abundant amount of time to be playful with my family. I feel recharged and energized. Whole. We watch as our guide coils the bowline in preparation to push off into the muddy current. The river is rising, and the flow seems to be increasing several hundred cubic feet per second each day. Dark irregular wood debris – stumps, limbs, boughs, and chewed up bits of tree – race through the murky waters. The San Juan is known as one of the muddiest rivers in the U.S. and so it isn’t entirely surprising to see a soggy tree rise from below the surface like some kind of river monster. Our guide steps safely to the raft. My dad launches into a story of landing his boat in similar opaque and scary waters: his passenger took the bowline and stepped off the boat into what she expected would be shallow water, but instead the bank was undercut and she plunged completely beneath the water before being quickly dragged out and unscathed by river monsters. Our hiatus from the plugged-in world is forcing us to interact with each other every nanosecond of the day. And it is beautiful. We talk to each other, tell stories, play games, get to know our loved ones and the good folks we’ve just met. Turns out almost everyone has a story about skunks. I learn three generations can play bocce ball without a hiccup. I’m amazed to find the dish line transformed into an improv comedy stage that I keep wanting to visit. 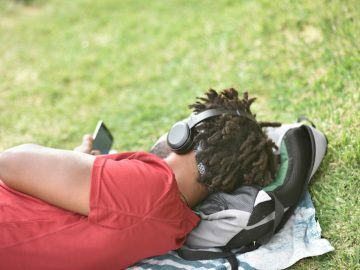 Unplugging is revealing the rejuvenating value of human interaction that can be so easily relegated to second place back home. Nyla scoops a handful of sediment, water, and “tadpoles!” We’re trying to make our way back to the rafts after a morning hike, but it isn’t working. Not one bit. Instead of following the adult agenda, Nyla has fallen behind the group and deep into child-led play. The small black tadpoles wiggle their tails in her hands, motoring to escape and trickle out between her fingers and back into the water. She waddles deeper into the mud and scoops again, full of delight. Then she decides she needs “to go number 1,” pulls down her shorts and urinates in the small creek. “Dilution is the solution,” she exclaims, reiterating something we’ve heard a number of times on the trip. And then, “hydrate or die,” as she reaches for my water bottle. Technology governs much of my life. Calendar alerts and emails build my to-do list both at work and home. My community is goal-oriented on an Olympian scale and the practice of “doing nothing” goes against the grain. But today, out here, I can feel how unplugging has relieved an enormous amount of stress. Without the heavy weight of the to-do list on my shoulders, I am relaxed and able to support and champion my daughter’s whims, instead of my own. I love feeling confident in giving her ample time for self-directed play, the kind that used to be plentiful generations ago and today is a rarity. I bask in the sun, feeling for a moment that I’ve got this dad thing down. The snake encounter moments later reminds me I have a lot to learn. Breakfast is over. It’s our last day of the trip and it is pouring rain. Hard. Like the kind of rain that makes you want to stay indoors. But we are packing up camp to get on the river. It is messy – rain gear, tents, dry bags, our hands, all getting coated with sand while we try to keep our body temperatures up. Nyla, who has been wandering about with her new friends, appears and announces that she’s found a hat. It’s a black canvas hat with a full brim that can be buttoned up for a cowboy hat-like silhouette. Synchronicity, or “meaningful coincidences,” are said to happen all the time. When I’m wired into the matrix they don’t seem to happen, or maybe I just don’t recognize them. But now, by the last day of our trip, my senses seem heightened, no doubt an effect of using them a lot for days on end. I wonder, is the hat a note from the Universe telling me I’m in the right place? Is this feeling of deja vu something I should pay attention to? Regardless, the things happening on this trip keep coming packaged with a sense of extraordinary. Being unplugged has made the whole world seem more magical. By a magnitude. Will I try to unplug for 100 hours again? 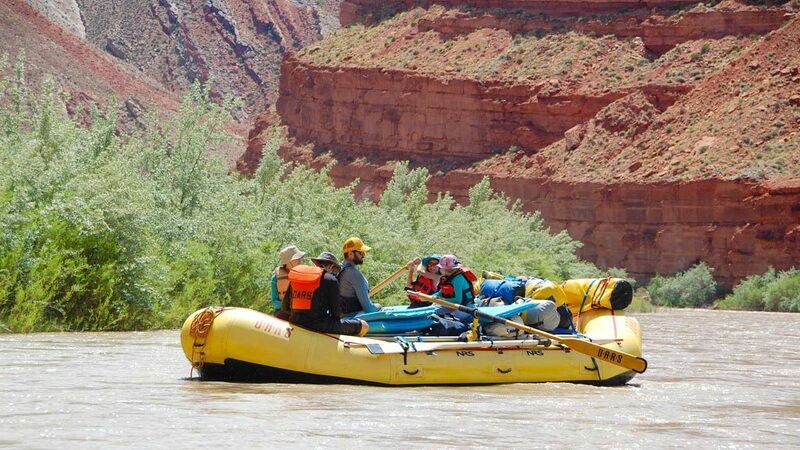 Now that we’re downstream of the class II drops—Four-Foot Rapid, Eight-Foot Rapid, and Ledge Rapid—Nlya is taking a turn at the helm of our boat. She steadies the long wooden oar in the oar lock, leans forward, sets the blade into the sediment-rich water, and then leans back pulling with two hands and all her might. Her friend does just the opposite – the boat rotates in a circle. Hilarious. Around and around they go. A huge smile soars across Nyla’s face. And mine, too. It’s damn fun watching her. I think back to the days of my childhood, sitting barefoot on the wooden storage boxes my dad made, next to my brother, pulling with all my might on the giant wooden oars. On Thursday morning, I return to work. After nearly five days of being unplugged, making eye contact with my smartphone and computer is eerie. Maybe I’ll just look from the sides and only burn the cones. Maybe there’s a dish line somewhere I can go join. The truth is I don’t want to plug back into the grid. I want to go back to the river. Back to spending day after day with family and new friends, being present, telling stories, playing in canyons, swimming in rapids, and…catching cute lizards. 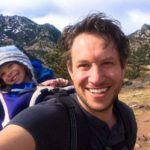 Jason founded and leads a human-powered adventure club for families and is the author of several books that help parents get their children outdoors and reconnected.